This ancient and distinguished surname, having no less than twenty Coats of Arms, and with several notable entries in the "Dictionary of National Biography", is widespread both in England and Scotland, and is a locational name from any of the various places in Normandy, for example Saint-Clair-sur-Elle in La Manche; Saint-Clair-l'Eveque in Calvados, and St. Clare in the arrondissement of Pont d'Eveque, so called from the dedication of their churches to St. Clarus. The Middle English and Old French female given name "Cla(i)re", which derives from the Latin "Clara", itself coming from "clarus", famous, achieved great popularity on the Continent through the fame of St. Clare of Assisi (1194 - 1253), foundress of the Order of Poor Clares. The surname was introduced into England by the Normans after the Conquest of 1066, and has the distinction of being first recorded in the Domesday Book. Other early examples of the surname include: Richard de Sencler (Norfolk, 1086); Ralph de Seintcler (Somerset, 1197); and Emma de Sancler (Kent, 1198). 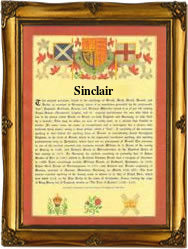 The Scottish Sinclair family, which includes the Earls of Caithness, originally held the Norman barony of Saint-Clair. Sir William Saint-Clair (1240 - 1303), was a leader of a rebellion against Edward 1 of England; his son, Sir Henry Sinclair, fought for Bruce at Bannockburn, and Sir Henry Sinclair was created Prince of Orkney in 1379. The first recorded spelling of the family name is shown to be that of Hubertus de Sancto Claro, which was dated 1086, in the Domesday Book of Somerset, during the reign of King William 1, known as "William the Conqueror", 1066 - 1087. Surnames became necessary when governments introduced personal taxation. In England this was known as Poll Tax. Throughout the centuries, surnames in every country have continued to "develop" often leading to astonishing variants of the original spelling.